Your Colombia Bucket List - 10 places you cannot miss! 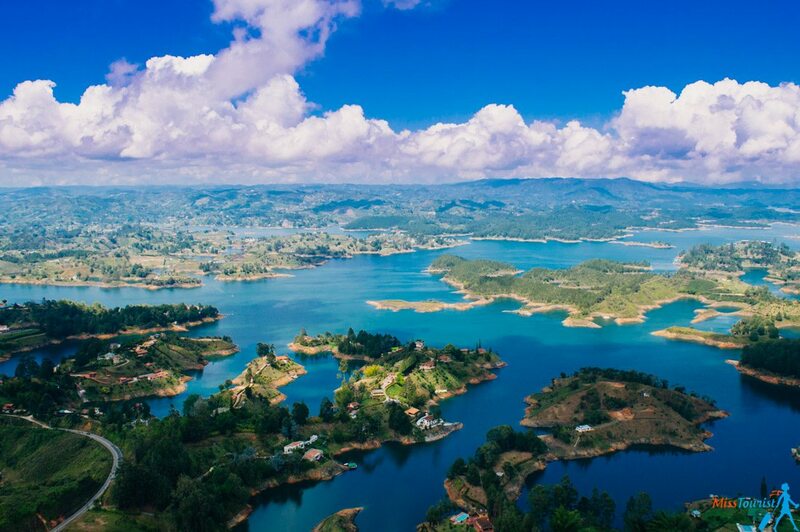 Colombia is truly infinite – there is so much to discover in terms of culture, traditions, food, nature, and people. 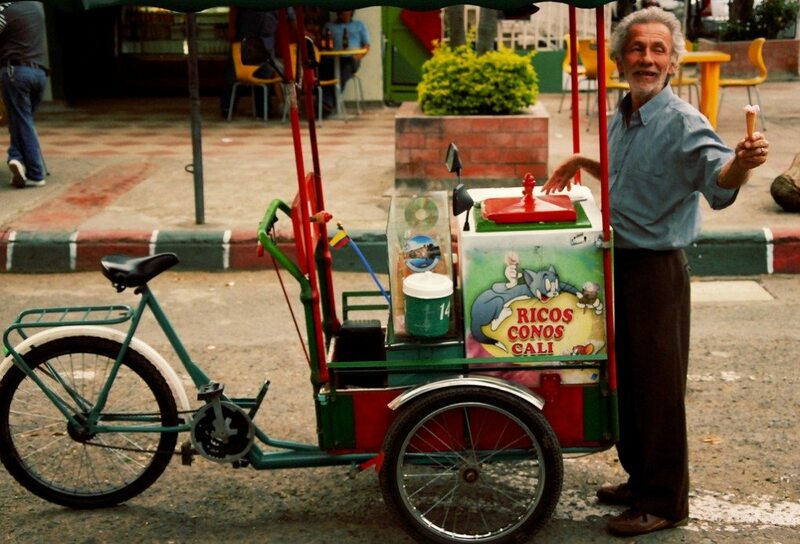 Colombia has some of the friendliest and positive people I have ever met! That is why, even if I have been traveling in Colombia for about 2 months, I still did not manage to see everything. However, I had a chance to discover some really cool places, that you, dear reader, might be interested about! 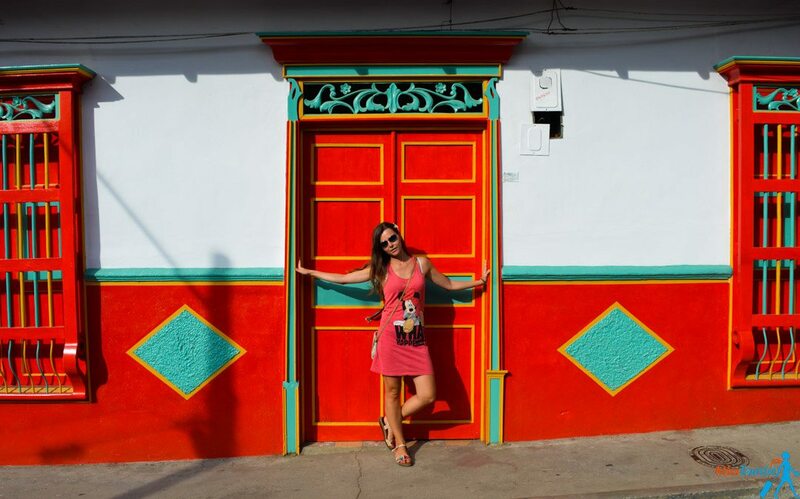 So, if you are heading to Colombia (or just thinking about it) any time in the future, read on, this list might give you some inspiration about where exactly spend your Colombian vacation! The capital of the Antioquia region is Medellin. They call it “The city of the eternal spring” (Ciudad de la Eterna Primavera) because it has a fantastic mild climate all year long! 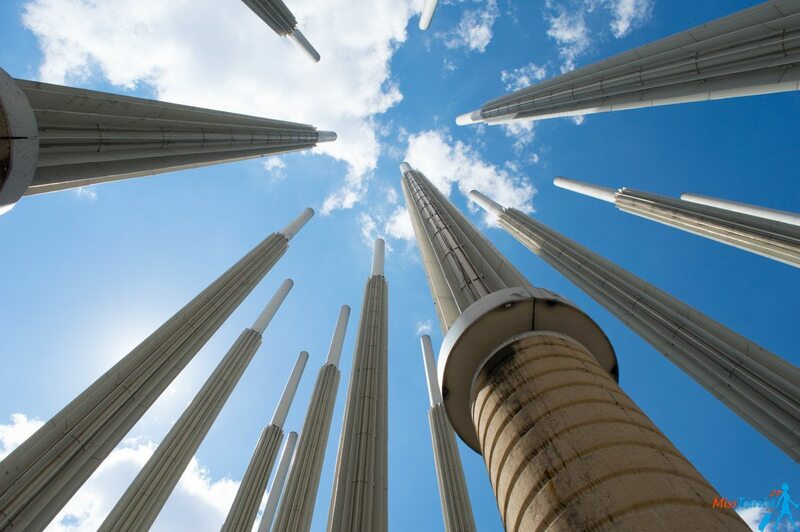 Medellin was a home to the infamous Pablo Escobar and his drug cartel. Yes, Medellin was one the most dangerous city in the world back in the days! But you know what? It is impressive how it can change in just 15 years! Now Medellin is the only city in the country that has a metro, the streets are very pretty, the whole city is developed and full of nice cafes and restaurants. 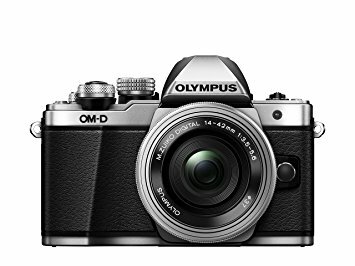 I fell in love and stayed for a month! If you can only do one thing in the city (they are so many though), take a cable car up for the fabulous view. There is this little charming town called Jardin located a few hours drive away from Medellin. Even if it is not that well-known throughout tourists yet (it is hardly presented in guide books), I definitely recommend you visit that place! 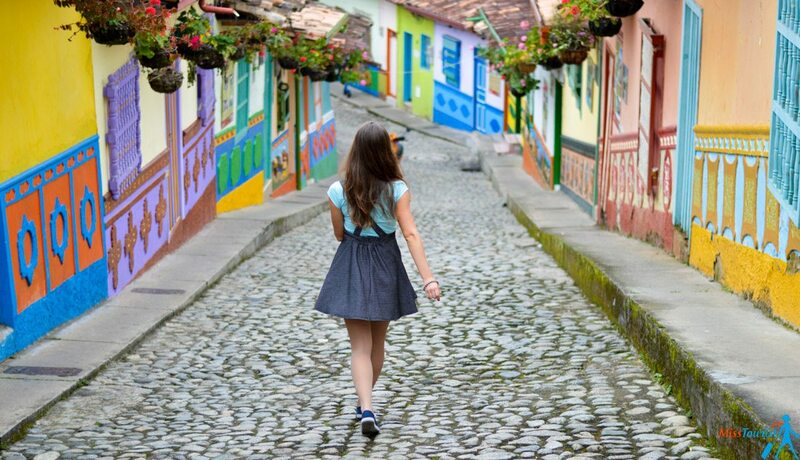 Jardin is the town where you will see the real, Colombian life, untouched by tourists! 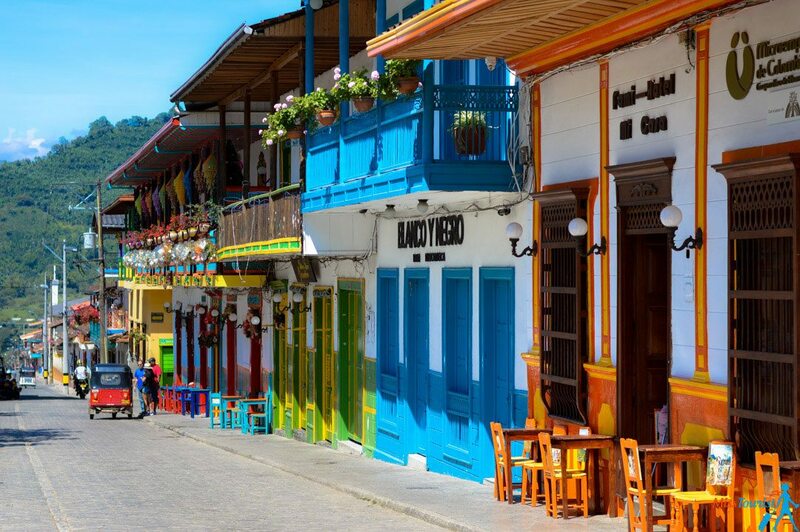 Locals, drink their tintos and discuss news, the atmosphere is relaxed and the buildings colorful, as they color them for themselves, not for tourists. I felt the most authentic atmosphere there. I hope it won’t become one of those super mainstream places. Hurry up to visit! RELATED READ: Jardin – the most beautiful pueblo in Colombia! OK, let’s be frank here, Guatape IS one of those touristic charming towns where many things are made mainly for tourists. But, oh well, it is still a wonderful place to be and the pictures opportunities are endless (colors! colors everywhere!). 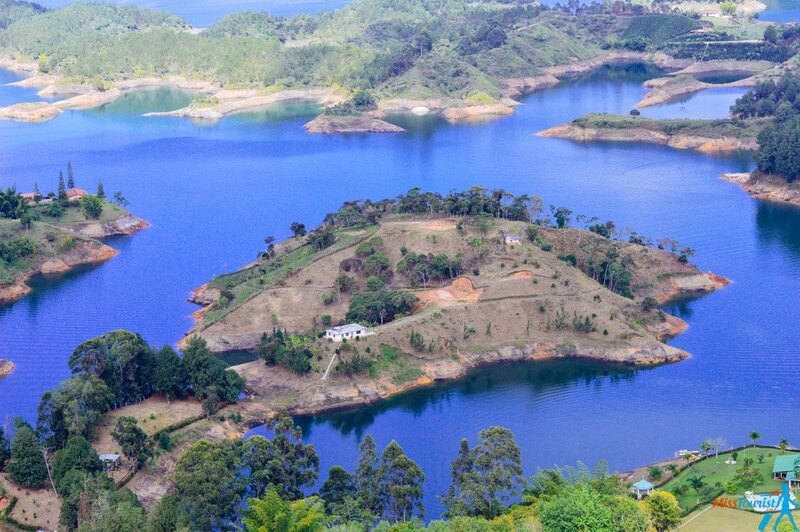 Moreover, Guatape has somethings fantastic that no other destination have – El Peñón (or La Piedra) meaning “the stone. La Piedra is a huge monolithic stone that gives a breathtaking view after you climb it. Yes, climbing all the 650 stairs might be physically challenging for some of us. But hey, I did it, so can you! The view is worth it! Do take the boat trip around the islands, it is so much fun! You will not only see the houses of rich and famous Colombians, but also the bombed Pablo Escobar house (because, you know, rival cartels had bombers..) . Except that, you will enjoy the truly mesmerizing nature! 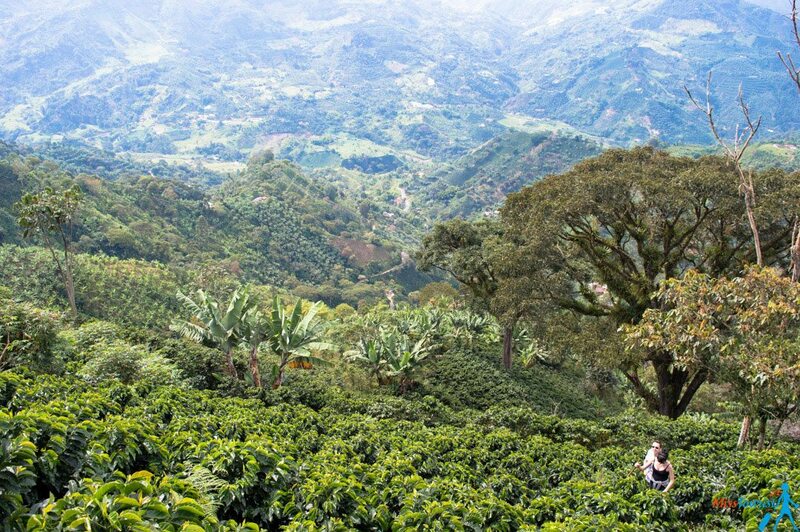 Were you ever interested exactly how your fine-blend Starbucks coffee was actually produced? No better chance to see it in practice while you are in Colombia! You yourself will participate in picking up the coffee berries (yes, they are berries actually) and see the whole process of coffee preparation in practice. Even if I am not crazy about coffee, but even so, I really enjoyed my excursion and, I believe, you will too! Tayrona Park is an incredibly beautiful national park that is situated on the Caribbean coast near Santa Marta. Whether you are going with your friends, alone or even with kids – this park is a great fit for everybody! I am writing about accommodation and food in greater details here. You should go there for at least a couple of days to get mesmerized by the nature and to switch off completely from the real world. I enjoyed my Internet detox experience so much! ALSO: As another option, you can also hike past indigenous tribes to Ciudad Perdida (the Lost city), some of the highest coastal mountains in the world! It takes about 4 days and I have heard that it is physically demanding. Even if Bogota might not be number 1 in my Colombia list, I am very glad I stopped by for a couple of days, as there are quite some interesting places to discover, too. First of all, stroll la Candelaria district, Bogota’s colonial old city. Take a funicular up to the Monserrate Mountain for an amazing view to this endless city. Go visit some of the most interesting museums – the Gold museum, you will not regret! 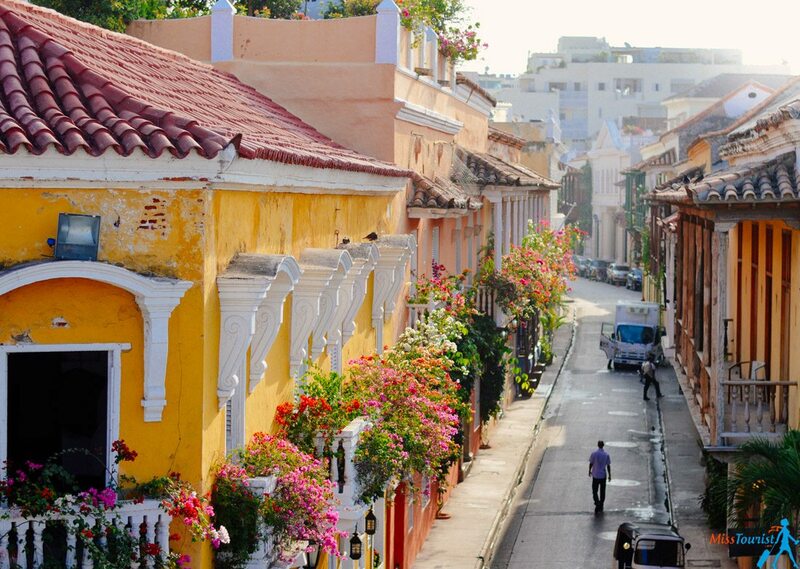 Cartagena is a popular coastal destination with a nice looking Old city. It was a first Spanish colony of the whole American continent, so, you can imagine, the old city is quite interesting to visit. Cartagena is worth a visit at least of its colonial past, but also the beaches and the islands around Cartagena are not to be missed! Enjoy the white sand beach of Playa Blanca and, when bored, get out of the city and discover all those Bounty commercials-like stunning beaches. Please be warned that, as it is the most popular tourist destination in the country, it can get very crowded, especially in December in January, the highest season. No, I am not inviting you to fly all the way to sunny California! There is an even sunnier city in southwest of Colombia called Cali! 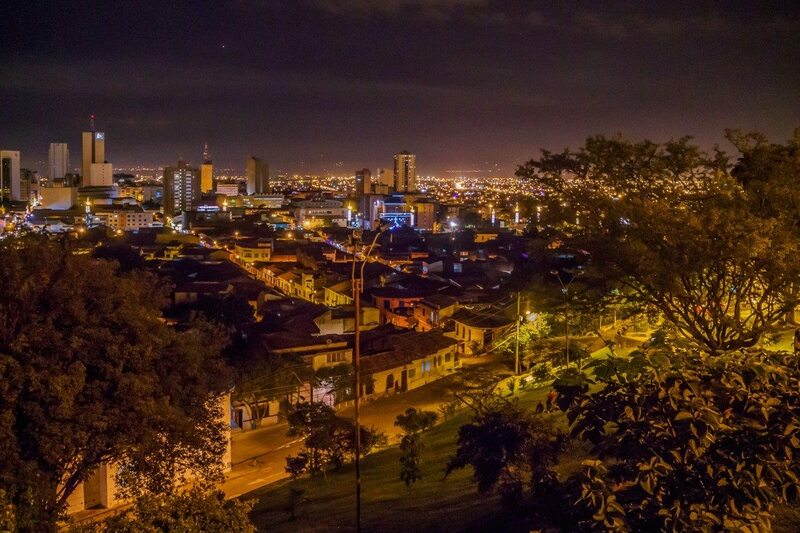 Cali is one of the most beautiful cities in Colombia where the salsa dance originated from. If you were thinking to learn some salsa, this is exactly the place! Take some lessons or just go out and see it live. You can find people dancing salsa every night on the streets, here and there. The best salsa clubs to go to are located in Menga district. If you fancy discover the surroundings, there is Popayan (also known as a “white city”), it is just 1,5 hour drive away from Cali. The picture you see above is not modified in anyway, it is actually THAT red. But no worries, no criminality involved here, it is a natural phenomenon. Between July and November (after the rainy season) a plant called Macarenia clavígera appears in great quantities in the river. And it is red due to the lack of nutrients. Easy, huh? Yellow, blue, green, red and black – you will find all those colors there in abundance, and that is why it is called the “River of 5 colors”. 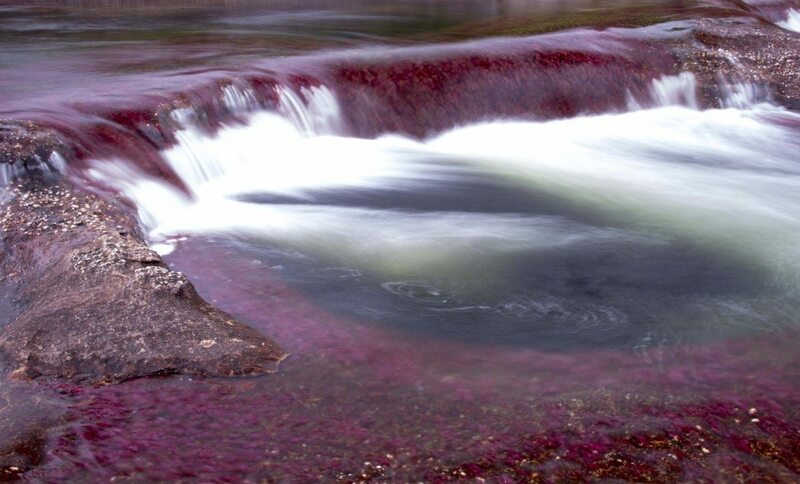 The region where the river flows (Serranía de la Macarena) is located on the boarder of 3 large ecosystems. 420 species live there, the river is 100 km long and hosts 43 types of reptiles. As it is not exactly easy to reach, at the moment it is quite unspoiled by tourists and is totally worth the effort! If you will take a look on the map to check where San Andres is located, I bet you won’t even think at first that this island belongs to Colombia, it is so far from the mainland country! Then take a look at those pictures of the island. I think, there is no need to advertise San Andres, is there? Isn’t it paradise come true? The turquoise water is so incredible and the flights from mainland Colombia are relatively cheap that you cannot miss it! Here I have carefully chosen the list of the best hotels according to your budget, all in the heart of the city and all with fabulous reviews. Click on the name to see the rate. Hurry up to book them, good places gets sold out pretty fast! 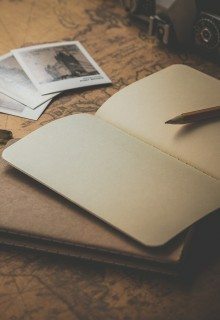 10 places make up a not that little list, but hopefully, reading this post and seeing the pictures, it could give you an idea of what you want to see for sure and adjust it to the amount of days you will have. Don’t be sad if you think it is not enough time, I have been there for 2 months and it was not enough at all! There are so many others, I tried to fit it in 10. What would you add? 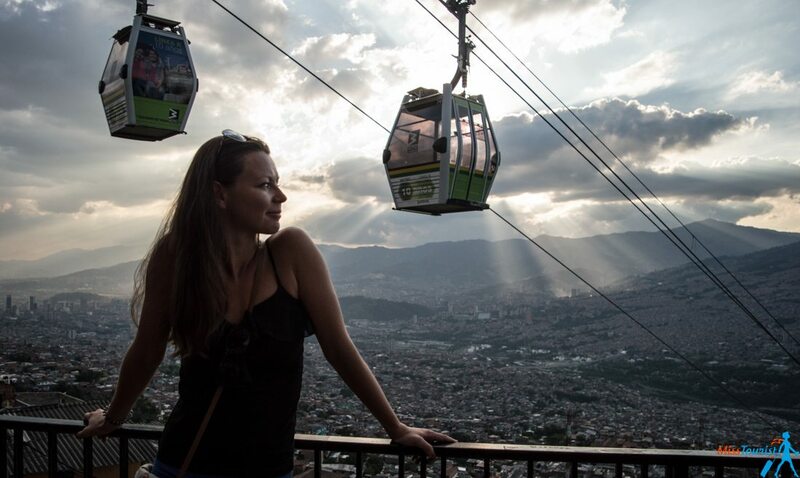 Thanks Yulia – absolutely hands down the best guide to Colombia I’ve seen. Wasnt quite on my list, your top ten makes it look super special, its going on my ” places to see” right now! One of my best memories was when we took a day excursion for about $60USD per person to a private resort on Isla Grande (part of the Rosario islands) off the coast of Cartagena! It includes an amazing lunch buffet and a 45 min boat ride to and from the islands. Worth ever penny! Talk about paradise!! How do you suggest getting to Jardin? I’ve seen tours that go there from Medellin, but they are very pricy for 1 person! Thanks for your great sight, good humor, and inspiring information! have a great time in Jardin! 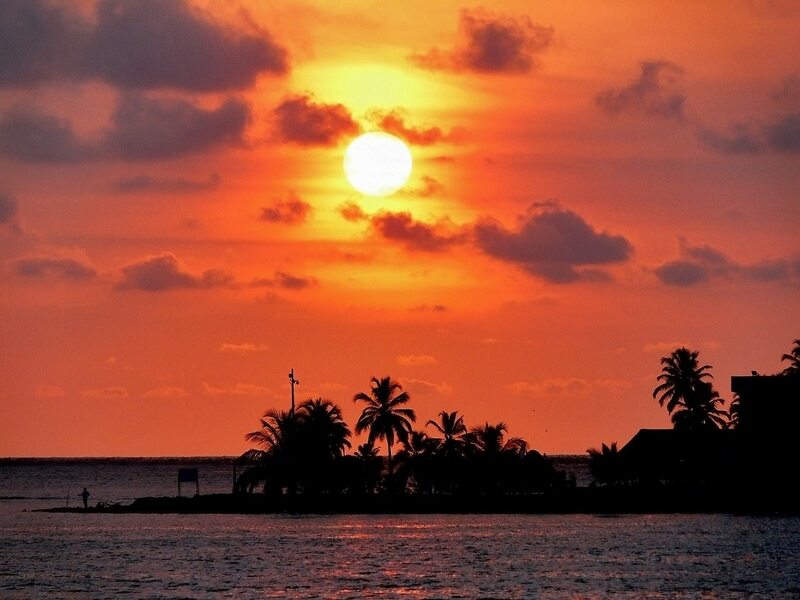 Do you think it’s worth a visit to the Rosario Islands? I hear it is very touristy with many vendors, etc… Are the coffee plantations around Jardin considered part of the coffee triangle? That may be the only coffee zone I’ll have time to visit. I’ve never drank a cup of coffee in my life and I’m in my 60’s. Have i been missing something? (-: The coffee areas look beautiful so I’m looking forward to absorbing all the beauty! No idea about the islands, sorry, but i have been to Jardin and can totally recommend it, take a look at my article! 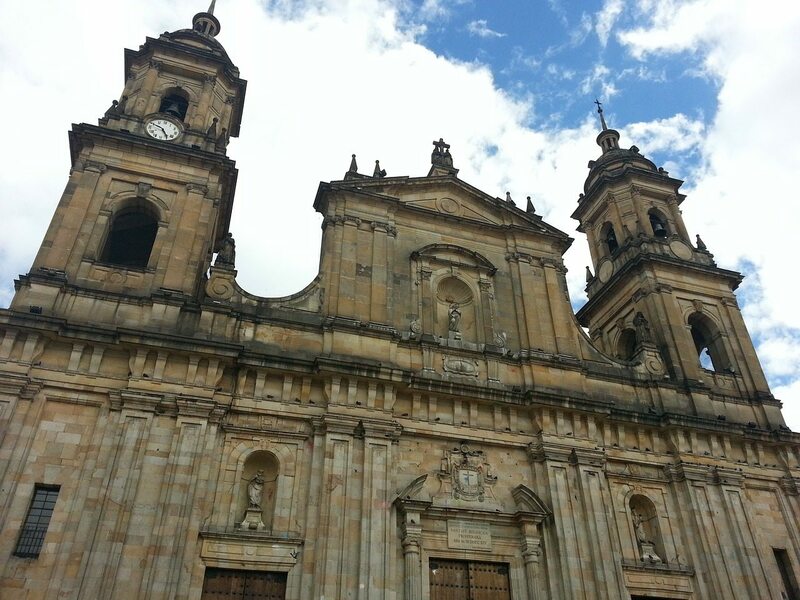 Colombia is always my most favourite one destination for visit as travelling point of view. I had a great time there but I will love to make a tour there for again and again. In my point of view it is a perfect destination for all kind of visitors. It is an amazing country, I couldnt agree more! Thank you for the great information Yulia. I am a Colombian born who resides out of the country for 20 years. My husband and I are planning to visit soon. Very good information here, thanks again.